She survived, and eight days after her liberation sat down and detailed her experience in this testimony. By using a physician’s detached language, she was able to describe the horrors she’d seen—she was, for example, the first person to report precisely how the Nazis worked the gas chambers—and thus become the only female doctor to bear witness to Auschwitz. 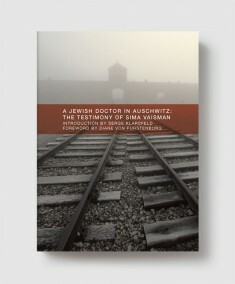 Afterwards, Sima Vaisman put her testimonial in a drawer and refused to talk about her experience. Forty years later, one of her nieces opened the drawer…. Brought to publication in France by the famed Nazi-hunter Serge Klarsfeld, here with a foreword by internationally renowned fashion designer Diane von Furstenberg, niece of Sima Vaisman and herself the daughter of an Auschwitz survivor.